This post’s routine, Update_Entries, cycles through all the records in an Excel range and updates any pending entries using the Update_Entry function from last post. You may wonder why I have a single record update routine (SRUR) and a multiple record update routine (MRUR). Why not just write a larger routine that does both? The answer is that by having an SRUR, I can test that specific functionality very easily and I have what amounts to an entry point into the MRUR when I want to update just one record. Since the MRUR leverages the SRUR, none of the SRUR code is duplicated in the MRUR except error handling. However, having the routines split does cause one problem – mutliple database opens and closes. Multliple database opens and closes slows things down dramatically. In order to maintain speed, the SRUR accepts a connection object as well as a connection string. If the connection object is provided, the SRUR leverages that and avoids creating its own connection to the database. 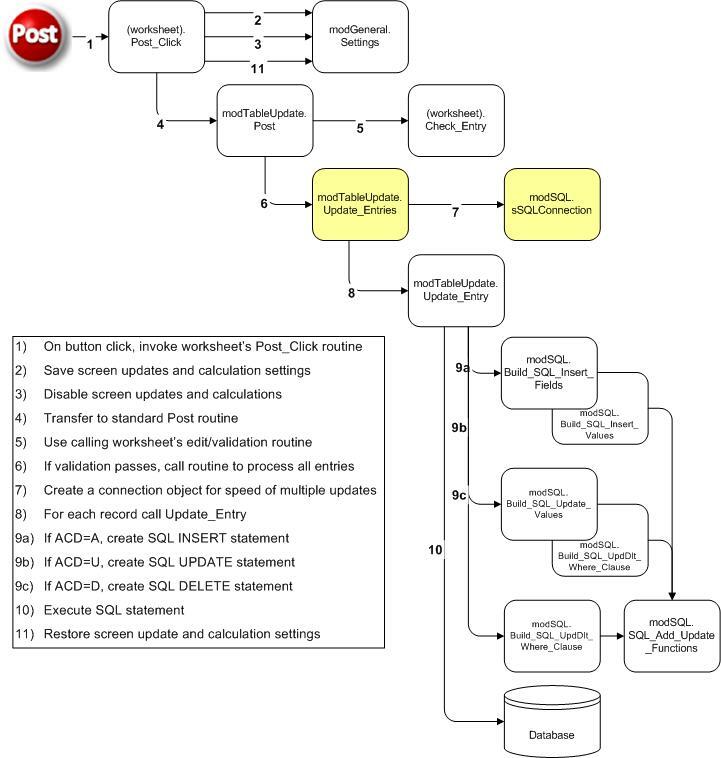 So to support that goal, we have a routine that creates a connection object that can be passed between functions – SQLConnection. Dim iACD As Integer         'Column holding ACD (Add,Change,Delete) instr.